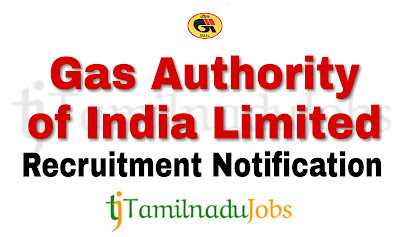 Latest Govt jobs: Good news for the Aspirants looking for job in Central Government, now Gas Authority of India Limited (GAIL) published an official notification for 160 post to fill the Junior Engineer, Foreman, Technician, Assistant and other, work in anywhere in India. Candidates must go through the official GAIL recruitment notification thoroughly before apply for Junior Engineer, Foreman, Technician, Assistant and other post. GAIL Various Disciplines job application is collected through Online mode only. The applicant meets the eligibility norms of GAIL only apply for the Junior Engineer, Foreman, Technician, Assistant and other, else ignore. Aspirants have a golden opportunity in the GAIL. Applications are invited to the Junior Engineer, Foreman, Technician, Assistant and other in Gas Authority of India Limited (GAIL). Aspirants can apply only by Online, application forms is available online from 14-11-2018 11:00 to 30-11-2018 18:00 to the GAIL latest job notification 2018. The Aspirants are requested to read some basic information about the GAIL job notification 2018 like eligibility criteria, age limit, selection process and more given below. Before applying, candidates are requested to read the official notification of GAIL Recruitment 2018 for more detail and correct information on their official website(http://gailonline.com/). In the recent Recruitment Notification, the following vacancy details given by the Gas Authority of India Limited (GAIL) and aspirants should go through the vacancy details and eligibility details for more detail in GAIL notification link given below before applying. Vacancy details of GAIL is given below. Here we give only the education and age limit criteria for the GAIL Recruitment notification 2018. For more detail Junior Engineer, Foreman, Technician, Assistant and other eligibility details like physical fitness and more, read official notification. Before apply for Junior Engineer, Foreman, Technician, Assistant and other job, candidates must go through the eligibility details in official notification of GAIL Junior Engineer, Foreman, Technician, Assistant and other. Aspirants meet the education qualification of Gas Authority of India Limited (GAIL) only apply for the Junior Engineer, Foreman, Technician, Assistant and other job. GAIL Recruitment notification 2018, education qualification are given below. Junior Engineer: Must have Diploma in Engineering in Chemical or Petrochemical or Chemical Technology or Petrochemical Technology or Mechanical or Production or Production & Industrial or Manufacturing or Mechanical & Automobile with minimum 55% marks for ST Candidates and Minimum 08 years Post Qualification Experience in line in Chemical discipline in supervisory capacity. Foreman: must have Diploma in Engineering in Electrical or Electrical & Electronics or Instrumentation or Instrumentation & Control or Electronics & Instrumentation or Electrical & Instrumentation or Electronics or Electrical & Electronics or Mechanical or Production or Production & Industrial or Manufacturing or Mechanical & Automobile or Civil with minimum 60% marks and Minimum 02 years post qualification experience in line in Relevant discipline in Power or Steel or Cross Country Hydrocarbon Pipelines or Hydrocarbon Process Plants. Junior Superintendent (Official Language): must have Bachelor Degree in Hindi Literature with minimum 55% marks and Should have English as one of the subjects in Graduation and Minimum Three years experience in line in English to Hindi translation and vice-versa of various reports, documents, letters etc., preferably State or Central Government or Public Sector Undertakings or Banks or Financial Institutions of repute as an employee of that Plant or Undertaking or Organisation. Technician: Must have 10th(Matric) plus ITI Tradesman ship or National Apprenticeship Certificate in fitter or diesel mechanic or machinist or turner trade or Instrumentation or Electrical or wireman or Electronics or Telecommunication and Minimum Two years post qualification experience in line in Relevant discipline in Power or Steel or Cross Country Hydrocarbon Pipelines or Hydrocarbon Process Plants in State or Central Govt. Department or Large Private Sector Organization. Assistant (Stores & Purchase): must have Bachelor Degree with minimum 55% marks and Minimum One year Experience in line in the Stores or Contract & Procurement or Materials Management Department in State or Central Govt. Department or Large Private Sector Organization. Accounts Assistant: must have Bachelor Degree in Commerce (B. Com) with minimum 55% marks and Minimum One year Experience in line in Finance or Accounts Department in State or Central Govt. Department or Large Private sector. Marketing Assistant: Must have Bachelor Degree in Business Administration (BBA or BBS or BBM) with minimum 55% marks and Minimum One year Experience in Sales or Marketing in State or Central Govt. Department or Large Private Sector Organization. Assistant (HR): must have Bachelor Degree with minimum 55% marks and Minimum One year Experience in HR functions in State or Central Govt. Department or Large Private Sector Organization. Aspirants who want to apply for GAIL Various Disciplines 2018, must attain the following age limits given by Gas Authority of India Limited (GAIL). Given Age attained aspirants can apply for the GAIL Various Disciplines job. Aspirant apply for Junior Engineer maximum age limit is 45 yrs for ST category, for Foreman, Junior Chemist and Junior Superintendent maximum age limit is 28 yrs and for Technician and Assistant maximum age limit is 26 yrs to apply for the GAIL Recruitment 2018. The application fees for Gas Authority of India Limited (GAIL) Junior Engineer, Foreman, Technician, Assistant and other 2018 differ according to various categories. Aspirants will have to pay the application fees for GAIL Various Disciplines via Online modes only. The application fees details for GAIL Various Disciplines given below. Aspirants have to pass the following selection process given by Gas Authority of India Limited (GAIL) to get Junior Engineer, Foreman, Technician, Assistant and other job. For more detail and correct information check in the official website of GAIL. How to Apply GAIL Various Disciplines 2018? Step 5: Before submitting the application for Junior Engineer, Foreman, Technician, Assistant and other, check the details are correct, then press submit and pay the application fee. Gas Authority of India Limited (GAIL) is announced the recruitment for the Junior Engineer, Foreman, Technician, Assistant and other to full fill their 160 posts. Aspirants can check the salary details for the Junior Engineer, Foreman, Technician, Assistant and other in GAIL.